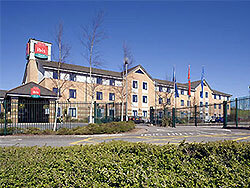 The second of two Ibis hotels in Cardiff, this one is located to the North of the city in the Cardiff Gate business and retail park. This hotel is ideal for business visitors, because it is located near to the M4 motorway for easy access. There are 78 guest rooms and a hotel bar, which is open 24-hours. Located just off Junction 30 of the M4 motorway. 20 minute drive to Cardiff city centre. Hotel bar is open 24-hours serving soft drinks and snacks.